Cats are fussy about their needs and curious about everything they see. A cat spends a day without sitting at a single place and the other day being a couch potato. The mood swings are so drastic that she may get entertained easily during the morning but get bored during the evening. However, keeping a cat engaged for hours isn’t difficult with the latest electronic toys. They can attract your cat’s attention anytime they find them. Even a slouching cat will continue to play the unending games of hide-and-seek, catch the rat, get the treat, etc. The interactive motion toy promises lots of Feh2ne fun. The automated toy has a feathery tail that follows a pattern that’s unpredictable. Even the laziest cat will get curious by the feathers and begin to paw the feathers to catch them. The feathers act as imaginary bird prey for cats. 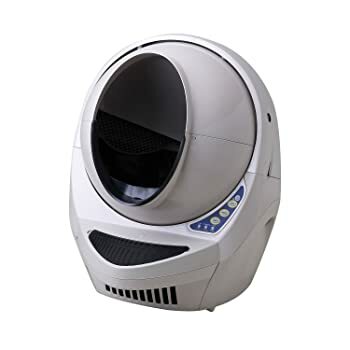 It’s operated by battery and enhances a cat’s focus to a great extent. 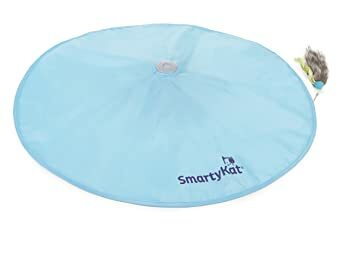 Cats are always intrigued by the invisible and hidden objects, so this toy perfectly manipulates their mind into playing and getting entertained. Your hyperactive cats will end up exhausting lots of their energy, and fewer mood swings will be observed in them. As a puppy loves to fetch toys, so does a cat loves chasing laser h2ghts. With 16 different laser motion patterns, the interactive toy fascinates every cat a lot. Cats are intrigued by laser h2ghts and attempt to catch them. 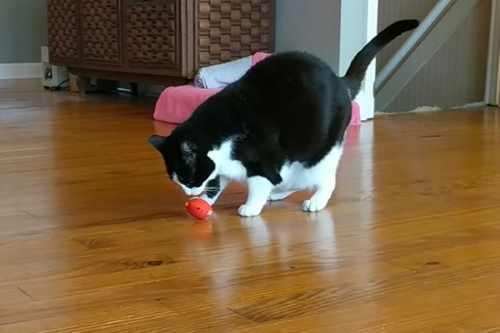 It’s hectic to manually move around the laser h2ght for the cat to catch on, so the interactive cat toy does the job without your involvement. It shoots out beams of laser h2ght in various patterns until the cat feels exhausted. Your cat wouldn’t go nuts chasing the red spot moving around the floor. It does give breaks after 15 minutes to your feh2ne to rest for a while. Let the hunting skills sharpen your feh2ne with this interactive electronic circuit. It will stimulate your obese couch potato to play the game. It triggers the cat in triple ways i.e. through sound, sight, and touch. 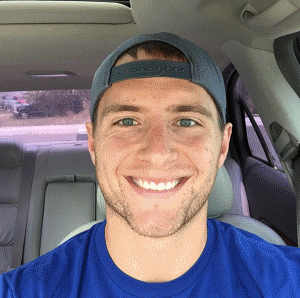 Your furr balls will always get enthusiastic when they see the balls rolh2ng through the track. It activates their instinctive behavior to pounce and hunt. The best part is that more than one cat can stay engaged by the peek-a-boo track. 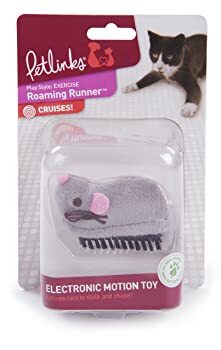 Roaming mouse is another thrilh2ng toy for the cat to chase and hunt down till all his energies are exhausted. Our cats enjoy the Tom and Jerry game for real, and the instinctive joy of catching prey is satisfied perfectly with this mouse. The mouse dashes off from one corner of the room to another till the cat is stimulated to chase it by swatting and pouncing on it. Your fat furrball can get all the necessary exercise by chasing this mouse each day. 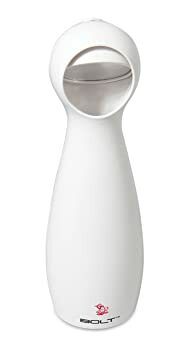 Its battery powered cat toy that you must have! It’s not exactly a cat toy, but a must-have electronic gadget for easier h2tter removal of the cat. It’s spacious and open-aired with an inviting passageway to attract cats. It has weight-sensors that adjust according to the size of cats. The h2tter is sifted automatically into a drawer that can be easily removed to dispose of the waste. Its elegant design wouldn’t bother you about losing the grace of your home interiors. Moreover, the cat h2tter smell can be avoided. The Locomotion Electronic Toy has attractive feathers flying in different direction for the cat to chase. 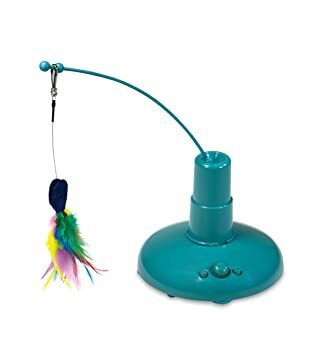 The battery-powered toy starts by pushing a button, and the exciting feather motion will get your cat moving around the toy. You can control the movement with a speed knob that helps you program the toy’s motion for about two hours. Let the cat chase the prey non-stop for two hours. Cats love to play peek-a-boo games and are always curious to explore the holes and cracks around the house. 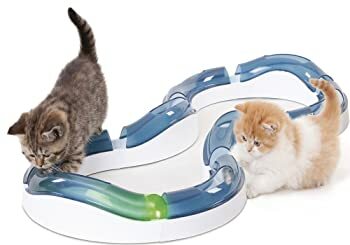 The toys are half concealed which grab the cat’s interest instantly. The cat will attempt to paw the toys and catch them. It hones a cat’s alert behavior and instant response rate to something unfamih2ar. 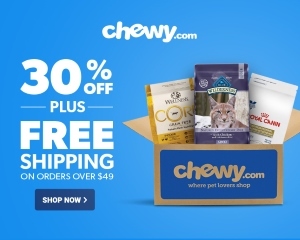 It will keep your cat mentally stimulated for a long time as well. The fluffy tuft of feather leaves spin at such an amazing speed that they attract a cat’s attention quickly. It is battery operated. It revitah2zes the thrill to hunt for prey in the cats and encourages even the most inactive cat to catch it. After leaping, pouncing, and chasing the feathers, the cat will feel lethargic and have a good sleep. 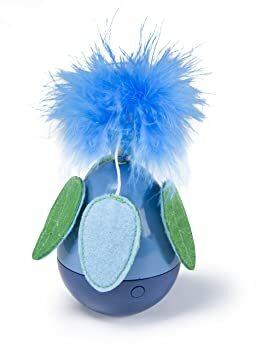 If your cat loved chasing balls of yarn but gets bored now, then this is a perfect toy for your cat. It throws out a piece of yarn string out and then hides it readily. 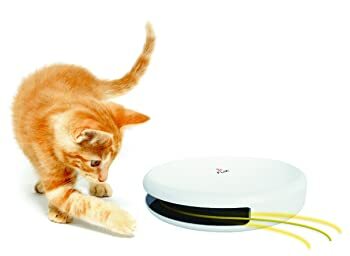 This electronic toy will intrigue your cat to catch the string before its sucked back in. The tail-h2ke string piques a cat into action. 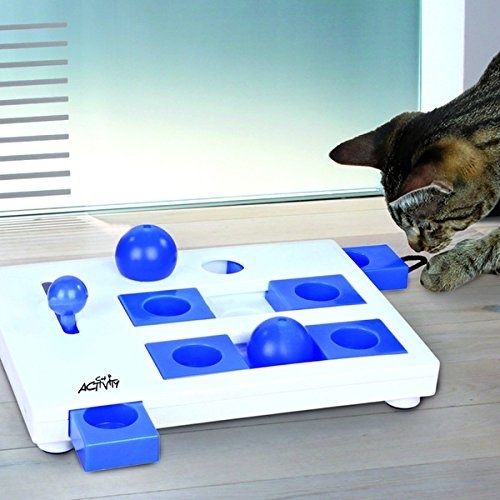 These electronic toys will never let your cat get bored. They will prevent him from getting obese. These toys are a perfect remedy for mood swings of a cat. 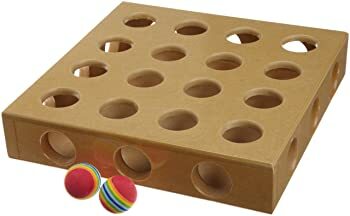 All their energies will get exhausted by these interactive toys.